CALL YOUR MOTHER AND SAY SOMETHING NICE! AND REMEMBER THAT I - ProudMummy.com the Web's Community for Mums. CALL YOUR MOTHER AND SAY SOMETHING NICE! 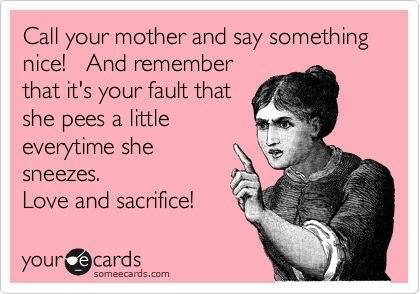 AND REMEMBER THAT IT'S YOUR FAULT THAT SHE PEES A LITTLE EVERYTIME SHE SNEEZES. LOVE AND SACRIFICE!